Being one the most anticipated annual events offered by Management Career Services (MCS), if you haven’t attended a Corporate Tour then you certainly know someone who has. Between May 2nd – 4th 45 Commerce, Management and MBA students will travel to Toronto, Ontario to explore a variety of employment opportunities. While being introduced to several corporate communities, students will expand their network, making connections to employers and Dalhousie Alumni. To accommodate each student’s interest, participants can register for one of three streams (Finance, Marketing or Discovery). On the 2011 Toronto Corporate Tour participating students were exposed to the inner workings of companies such as KPMG, Facebook, Google, Scotia Capital, Shell and Proctor and Gamble. Students gained a better appreciation for each company’s atmosphere, pace and corporate culture. There are great advantages in learning each company’s hiring goals and what it takes to be successful in their business. Overall, the experience helps students define their personal career endeavors; visualizing where they see themselves on their co-op work term and/or after graduation. Making connections with employers has proved to be of benefit when applying for employment opportunities. HR personnel receive dozens of applications for any one position. Having built on relationships established during the Corporate Tour, Dalhousie applicants have received further consideration and granted interviews for highly competitive positions. The Toronto Corporate Tour is an excellent opportunity for first and second year students to gain an overview of corporate culture and employment opportunities. They return to campus focused on developing their skills and experience to be a strong candidate in their industry/ company of choice. Upper-year students have attended the Corporate Tour with the goal of making connections that may lead to securing a full-time position after graduation. Registration for the 2012 Toronto Corporate Tour is now open. 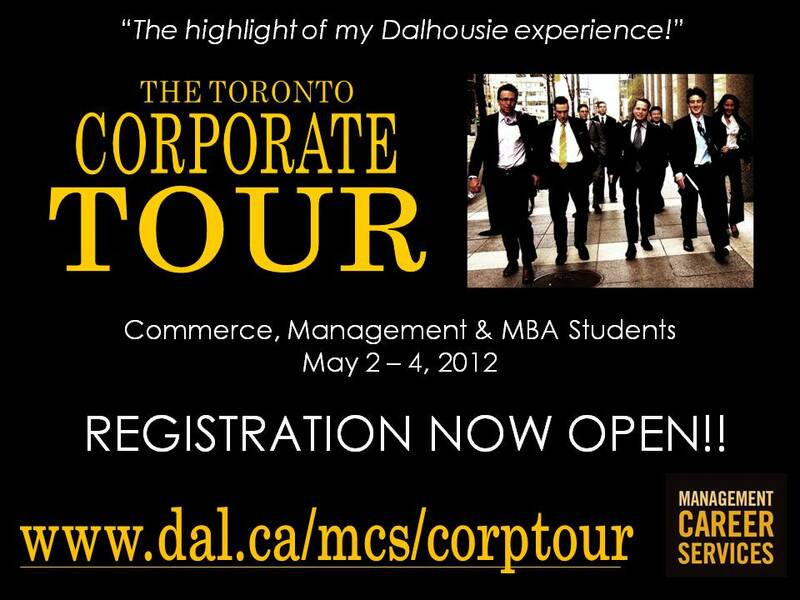 For more information or to register visit www.dal.ca/mcs/corptour or drop by Management Career Service Room 2100, Kenneth Rowe Management Building. There are limited spaces (15 per stream) so don’t delay!